There is so much to say about Nina Earl (now, Nina Westbrook). She is perhaps most famous for being a multiple award-winning college basketball player for the much recognized UCLA Bruins Women Basketball Team. But no one seems to remember her prowess and excellent performance as an athlete. Then, besides sports, she has also demonstrated deep interest and talent in music and is also said to be proficient in sign language. In this article, we will dwell deeply on the life and career of this unique American woman who has become the wife of the NBA big shot Russel Westbrook. Here, we are going to consider her biography, family li, e and other facts..
She was born Nina Ann-Marie Earl on January 16, 1989, in Upland, Southern Califonia where she was also raised. We do not have any records yet of her elementary school. However, official records show that Nina Earl attended Diamond Ranch High School in Pomona, California. Her fame in basketball began as far back as her high school days. Records have it that her high school basketball career was finished with an outstanding stats of 2,291 points, 906 rebounds, 298 assists and 544 steals. Following such high impressive school exploits in the game, Nina eventually landed an athletic scholarship tо the University of California in Los Angeles (UCLA). At UCLA, Nina continued to be an outstanding player on the College basketball women’s team, The UCLA Bruins. In her Freshman year, she played in 27 games and earned 15 points average. Then, she rose to be on the firѕt All American team. Her form continued in an upward curve through sophomore to senior year. During her junior year, Nina Earl received the Street & Smith’s and Rise Magazine‘s honorable mention All-America honors. Again, during her senior year, Nina led her team to the 2007 CIF title game, where she stood out with 35 points to her credit. Some of the outstanding highlights of Nina’s high school and college basketball career are: California Interscholastic Federation (CIF) Player of the Year, two-time member of California Hi Sports All-State selection team and the league MVP title on three occasions. Apart from basketball, Nina Earl also participated in track and field activities as already hinted. For example, she competed in the 4×400 relay and 400m in the CIF League. After her college career, Nina also played club basketball for FBC in 2006. She won the Adidas Tournament of Champions with FBC that year. Nina Earl is not found wanting in academics either. She studied psychology (major) and English (minor) at UCLA and graduated in 2011 with flying colors. Then, she went ahead to acquire a masters degree in clinical psychology. 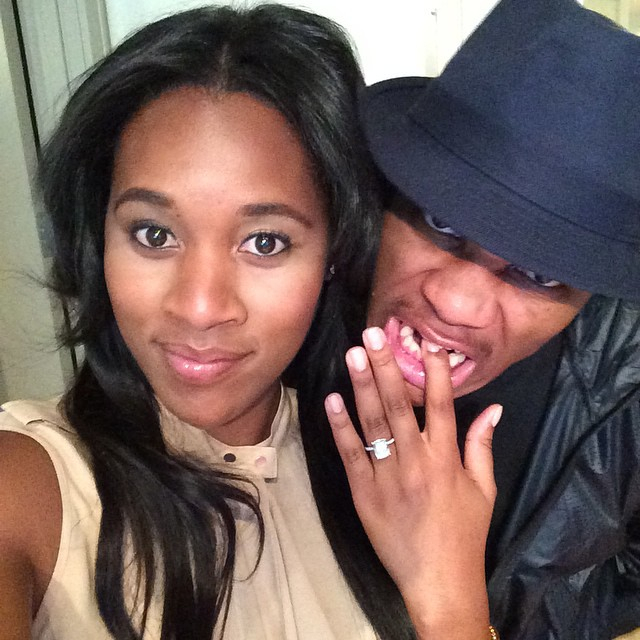 Nina Earl and Russell Westbrook engagement in 2014: Image source. Nina Westbrook (nee Earl) is very much a family woman now. Her surname changed since August 29, 2015, when she and Russel Westbrook married each other. Both Nina and Russel went to UCLA and both also played on the College Basketball team. Story even has it that the couple began to date back then in college in 2007. But, it would be seven years later that Russell would be proposing to Nina in a well reported engagement ceremony that featured a $700,000 diamond ring! Since their wedding in 2015, the couple has so far been blessed with three gorgeous kids. Their first kid and son is named Noah Russell Westbrook. Noah arrived in May 2017. Then, in November 2018, Nina Earl gave birth to a set of twin girls. The girls were named Sky and Jordyn. Social media posts from the couple (especially from Russell) testify that the couple are still very much in love with each other. They even embark on philanthropy together. They are said to be running a number of charity outfits. However, the only one we are able to trace is so uniquely named ‘Russell Welbrook Why Not? Foundation. According to the foundation’s website, it aims at encouraging kids to never give up. Her father is Michael Earl while her mother is Jennifer Lyons. She has three siblings (all brothers) named Michael, Jonathan, and Benjamin. Nina belongs is of Black American Ethnicity. As a result, her hair color and eye color are black. As per height, Nina Earl stands just 2 inches shorter than her husband, Russell, whose NBA listed height is 6 feet, 3 inches. It means therefore that Nina has a height of 6 feet, 1 inch (or 185cm). While her husband continued his career in the NBA after graduating from UCLA, Nina is said to have practiced what she studied working as a marriage and family therapist for a while. Nina Earl is currently an entrpreneur: She runs a kiddie entertainment center and gift boutique named Little Ark in Oklahoma. Her husband plays as a point guard for the Oklahoma City Thunder in the National Basketball Association.